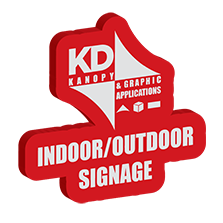 Indoor/Outdoor signs printed and cut with your designs. Grab attention with custom printed, cut or engraved signs. These are perfect for traveling to events or for long term applications like spicing up your storefront. Mount with standoffs to a wall for permanent use. Take these signs to the next level with lighted versions.